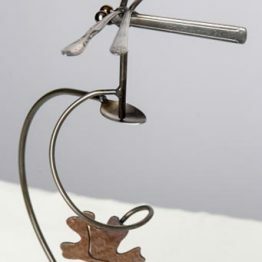 The Brew Bird balances on a spoon with a bird house for a counterweight. The body and head are made of spoons, and the wings are made of forks. The Brew Bird is as strong as it is sweet and being handcrafted, they’re all unique! The birds are stainless steel and will not rust. The ground stakes and the spiral are bare steel and will develop rust. If you do not like the look of natural rust, simply spray with a clear coat (urethane).